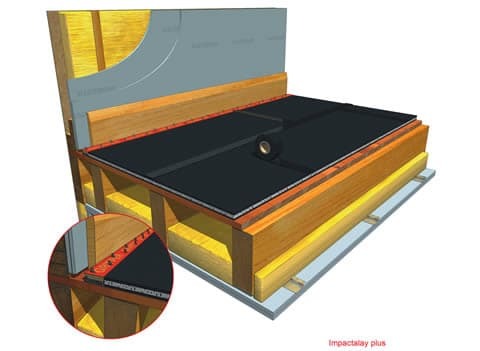 Impactalay Plus 15mm thick acoustic matting for timber floors offers a cost effective and easily installed solution to combat airborne and impact noise. It’s an complete soundproofing solution, combining three acoustic layers that combine to massively reduce both impact and airborne noise. Impactalay plus is manufactured using an acoustic foam resilient layer sandwiched between 2 layers of weight enhanced acoustic barrier mat. Impactalay Plus is suitable for timber floors and suitable for all final floor finishes. Material: JCW Impactalay Plus Acoustic Matting is made from two acoustic layers of barrier mat with a resilient chip foam core. The acoustic foam does not harden or crumble, unlike the Class O foam normally found in these applications. Versatile: suitable for all final finishes on timber floors.